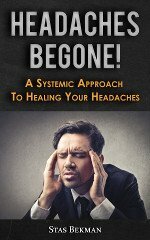 With single-joisted floors, where the ceiling is fixed to the under side of the joists, sounds can penetrate from one room to another, and whenever this is undesirable some methods of sound proofing must be resorted to. Strips of felt or indiarubber laid upon the joists before the floor is laid prevents the penetration of sound to a great extent. 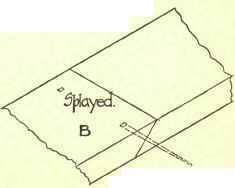 And floors with ceiling joists also offer considerable resistance to sound, particularly when they are supported by every third or fourth joist only, as at B, Fig. 266. Pugging is the name given to the operation of fixing layers of sound-preventing materials between the joists. The most usual method of doing this is shown at B, Fig. 266, where 3/4-inch boards are fitted between the joists, and rest upon 3/4-inch fillets, nailed to the sides of the joists and covered with a layer of slag wool or coarse plaster - the slag wool (silicate cotton) being preferable, as it is absolutely dry and will not harbour vermin. A very efficient sound-resisting floor is shown at D, Fig. 266, in which the ceiling is quite independent of the floor above, the ceiling joists being placed between the floor joists so as not to make the floor deeper than is necessary, while pugging is laid between them. Double and triple-joisted floors are fairly sound resisting of themselves, owing to the small amount of timber of the whole depth of the floor; but when it is desired to further increase their sound-resisting properties it is only necessary to place felt under the bearings of all the timbers. The most common form of floor covering is boarding, from 1 to 1 1/2 inch thick, nailed to the joists at right angles to their direction. Boards of narrow width are best, as the shrinkage which invariably takes place is less appreciable. The longer edges of floor boards are jointed to one another by any of the joints shown in Fig. 269. The cheapest method of laying a floor is to simply abut the edges and to nail them to the joists, two nails being used for each board at each joist, the boards being first brought tightly together by means of a cramp. 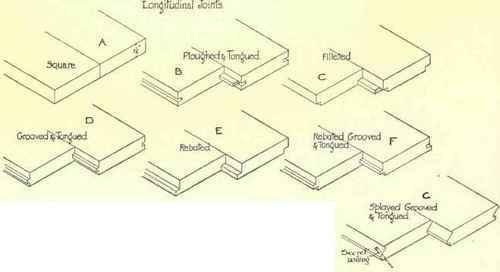 Ploughed and Tongned Joint is a form in which a rectangular section is ploughed out of the edges of every joist rather nearer the lower than the upper surface, and a wood or metal tongue is inserted in the groove, as shown at B, Fig. 269. The object of this joint is to prevent the passage of draughts and dust through the cracks when the floor boards shrink. 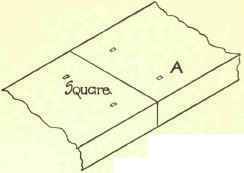 A rectangular section, or rebate, is sometimes taken out of the lower edges of the boards, the space being filled when laid by means of a fillet of wood, as shown at C. This is rather less expensive than a ploughed and tongued joint, but the loose fillet is liable to sag or drop between the supporting joists. A Grooved and Tongued Joint, as shown at D, is a very effective form of dust-proof joint, but it is rather expensive. A Rebated Joint is formed by taking a rectangular section out of one lower edge and one upper edge of each board, so that they overlap each other when laid as shown at E. It is perhaps the least expensive of dust-resisting joints. It is sometimes found that when the tongue of a grooved and tongued joint is not made very large a small amount of shrinkage will cause a gap sufficiently large to permit the dust to blow through. This defect is remedied by making the joints overlap more, as in the rebated, grooved, and tongued joint shown at F.
When it is undesirable to have the floor nails showing, as in a ballroom, a splayed, grooved, and tongued joint, as at G, may be used, a nail or screw being driven through the splay into the joist, and its head covered by the next floor board. The small ends of the floor boards are usually butted together, as at A, Fig. 270; but when it is desired to reduce the number of nails and make a more dust-proof joint, the ends of the boards may be splayed as at B. 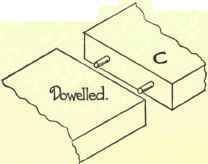 When a secret fixing is required the dowelled joint shown at C may be used, the nails or screws being driven obliquely through the end of one of the boards into the joist, while the next board is held down by means of hard-wood or metal dowels. When specially smooth floors are required a counter or under floor of ordinary floor boards is laid diagonally across the joists, and upon this an ordinary floor laid. The upper floor is usually of hard-wood battens, nailed to the counter flooring and brought to a true surface. - Counter floors are sometimes overlaid with small rectangular blocks of various ornamental woods, usually set to some geometric pattern, dowelled or glued to one another and glued to the counter floor. When the pattern permits of it, the small blocks are glued up together into larger squares to facilitate fixing. Wood blocks, shaped as shown in Fig. 271, laid in a herring-bone pattern, form an excellent covering to concrete floors. The concrete is covered with a layer of mastic composed of a mixture of pitch and tar well boiled together. The blocks are then pressed into position in the mastic, which oozes up into the V-shaped grooves on their edges, thus forming a key which keeps the blocks firmly in their places. , Fire-resisting Floors. - A good but very costly fireresisting floor is formed by placing the joists against one another and spiking them together, as shown in Fig. 272. The joists need not be so deep as in ordinary floors, a rough rule being as follows: The depth of the joists in inches is found by dividing the span in feet by 3 and adding 2. The upper surfaces may be planed to a smooth surface, or floor boards may be fixed in the ordinary way. Fillets are nailed to the under side of the joists to form a fixing for the laths, providing a satisfactory key for the plaster.